Discussion in 'World History' started by Adler17, Feb 10, 2006. This thread deals about the Naval activities in the Franco- German war of 1870/71. While there is much written about the land fights, the naval activities are pretty much unknown, mostly due to the fact that there weren&#8217;t any great battles. But nevertheless this area is a bit underestimated, so I will post here a small summary. Since I have only one good source, it will be from the German side, but giving the most important facts about the French side. In summer 1870 no side was prepared for a war. So also the small German navy wasn&#8217;t.
But at first short summary what happened before that summer. In 1848 the March revolutions in Germany brought the first German parliament in Frankfurt am Main- and the first war with Denmark. That trouble was explained by me in my thread about the history of Schleswig- Holstein so I will only give here a few basic informations about the war and most notably the naval situation. The newly formed German navy was very small. There were only a few frigates and corvettes- nothing really sufficient to beat the strong Danish navy. Nevertheless in the battle of Eckernf&#246;rde the German coastal artillery was able to sink the ship of the line Christian VIII. and disable the frigate Gefion which was captured and introduced into the German navy as Eckernf&#246;rde. But due to several circumstances the German states had to make peace with Denmark agreeing to a treaty in which the status quo ante was achieved. And with the following end of the revolution and the national assembly in the Paulskirche, the small German fleet was dissolved. Prussia, which wanted to build up a fleet for protecting the coast, bought some of the ships, including the renamed frigate SMS Gefion. In the next time Prussia tried to build up a fleet, but when the next war came there was still a small Prussian navy in the second war with Denmark in 1864. But despite the fact that the Prussian and Austrian navies were too small to beat the Danes, the Germans were able not only to beat the Danes in Jutland but also to invade Alsen. After that invasion the Danes made peace. The war of 1866 saw some battles in the Adria, like Lissa, but none in German waters, so the small Prussian navy was not involved in the fightings. After the German War the North German Confederacy was formed as the first German unified state since the death of the Holy Roman Empire. Nevertheless Bavaria, Baden, W&#252;rttemberg and Hessen were not in this confederacy. But they were allied with it in a secret mutual defence pact. In summer 1870 the German fleet was still in the phase of building up. 16 armoured frigastes, 22 corvettes and a number of gunboats shpould have been built until a war with France. The main core of the fleet were 5 armoured ships, 3 armoured frigates and 2 ironclads. The two armoured frigates SMS Kronprinz and SMS Friedrich Carl were both built in 1867 on British and French yards for Prussia. They were both about 7.000 t big and carried 16 21 cm guns. They were equivalent to the ships of other navies. Then there were two ships called armoured ships, but the terminus ironclad fits better. SMS Prinz Adalbert (1560 t) and SMS Arminius (1829 t). While latter was designed as monitor after the influence of the American Civil War, SMS Prinz Adalbert was built for the CSA as ram ironclad (Widderschiff). It was laid down as Cheops for Egypt but should go to the Confederate navy. 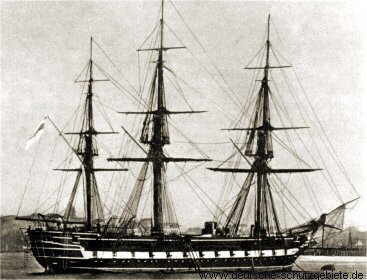 Because of diplomatic pressure by the USA the French government gave the order not to sell this ship and her sister Sphinx to the CSA, so the French yard had to find new buyers. And so to belligerent powers tried to buy them in 1864: Denmark and Prussia. Denmark rejected finally the CSS Sphinx, which was then given to the CSA, being in service as CSS Stonewall. She was given to the US by Spain after the war ended as the ship was in Havanna. Later it was sold to Japan. In 1865 however the ship was finally sold to Prussia with a price reduction of 100.000 Fr., but because of several reasons there were still problems to be solved. One of them was the danger to be captured and seized by the CSA in neutral waters as the ship was built originally for them. So Korvettenkapit&#228;n Schau, Kapit&#228;nleutnant Mac Lean and a German engineer director, Jansen, had to be as passengers there to prevent that on the maiden voyage to Germany, where she arrived without problems. SMS Arminius was armed with 4 21 cm guns and a brand new 35 cm torpedo tube, a new weapon the Germans had to test. It was not before 1880 when the weapon was recognized as the potential it had, when Kapit&#228;nleutnant Tirpitz, the later Grand Admiral, commandeered the torpedo test cruiser SMS Bl&#252;cher. SMS Prinz Adalbert was armed with one 21 cm and 2 17 cm guns. It was known as the lame Prince as due to bad wood it tended to have leakages. 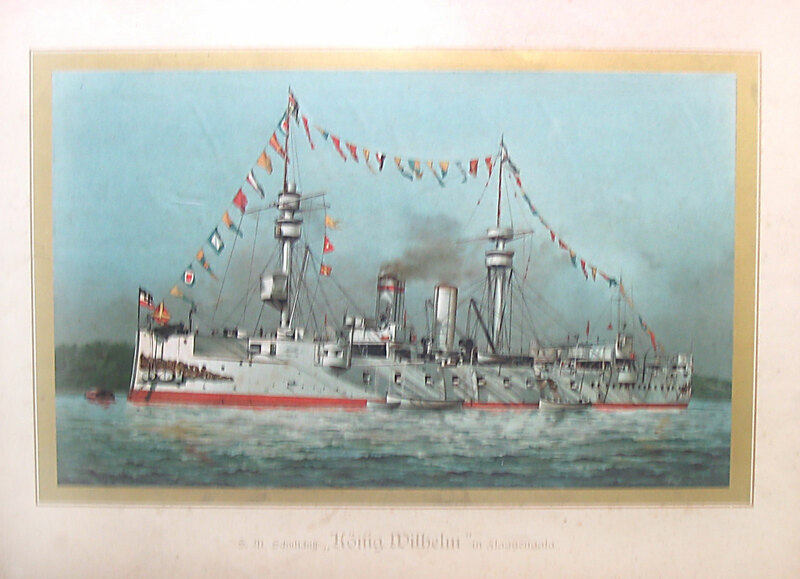 The flag ship however was in 1870 the armoured frigate SMS K&#246;nig Wilhelm. Originally built as Turkestan, later Fatih, for the Ottoman navy, the ship was sold to Prussia as the Ottomans could not afford the ship due to internal struggles any more and the fact, the British navy did not want the ship. 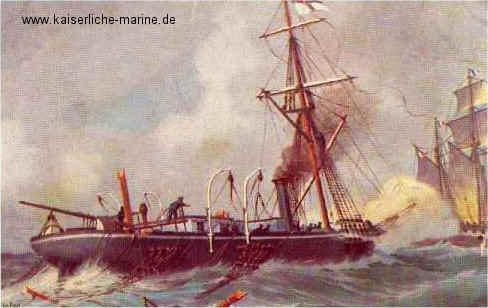 SMS K&#246;nig Wilhelm was the most powerful ship on the oceans in that days. 10761 t and 18 24 cm and 5 21 cm guns made the ship to a danger for any other ship on the waters. To these ships a number of so called flushdeck corvettes (sloops) (Glattdeckskorvetten), SMS Nymphe, Medusa, Augusta, Victoria and lightly armoured corvettes (Gedeckte Korvette) SMS Arcona, Elisabeth, Gazelle, Vineta, Hertha, has to be added. If someone knows the exact English terms, I would be glad if you tell me. These ships were equal mostly to cruiser. The last were 2912 t (SMS Augusta and SMS Victoria 2272 t) big with an armament of 17 15 cm (6 24 pounder, 4 12 pounder) guns, while the first displaced 1202 t and were armed with 10 36 pounder and 6 12 pounder guns (= 12 cm). As escorts a number of gunboats was used. These were the gunboats first class SMS Camaeleon, Comet, Cyclop, Meteor, Delphin, Blitz, Basilisk and Drache. They displaced 422 t and were armed with one 24 pounder (=15 cm) and two 12 pounder (= 12 cm) guns. Also there were the gunboats second class SMS J&#228;ger, Crocodill, Hay, Scorpion, Fuchs, Sperber, Hy&#228;ne, Habicht, Pfeil, Natter, Schwalbe, Salamander, Wespe, Tiger and Wolf. These 283 t small ships had the same armament like their big brothers. Also two avisos have to be mentioned, SMS Preu&#223;ischer Adler and Grille. The first one displaced 1430 t and was armed with 4 24 pounder and the second, which was also the Royal Yacht, displaced 491 t and was armed with 2 12 pounder guns. These smaller ships were already built on German yards. During the war only one ship was introduced: SMS Falke, an aviso of 1230 t and an armament of 2 12 cm guns. It should become a test ship for the new torpedoes. It was built in Scotland for the CSA but they never bought it. So the ship was sold to a Dutch being named as Heinrich Heister. In August 1870 Korvettenkapit&#228;n Graf von Waldersee should buy a test ship for torpedoes, when he found this ship. Due to neutrality laws, he went to the Dutch owner as Mr. John Smith from London and bought the ship for &#163; 12.500. After sailing out of the harbour of Dordrecht an der Oude Maas, Mr. Smith gave the order to run to the harbour of Delfzijl, where his &#8220;partners&#8221; wanted to have the ship. Because it was difficult to navigate in the mouth of river Ems due to the fact that because of the war signs were missing, Graf von Waldersee had, &#8220;coincidentally&#8221;, maps of the area and so lead the ship. After meeting the gunboat SMS Natter or Wespe, he told their commander what was going on and was escorted to Emden. As SMS Emden the ship was brought to Wilhelmshaven, where she was fitted out as warship and served from 4th of October as SMS Falke. The Aviso however was badly damaged by the first war sortie by being rammed by SMS Arminius. Because the only dock was occupied, the damages had to be repaired scantily. The ship was repaired in 1871 but did not re-enter service until 1875 after knowing the ship was not suitable as torpedo platform. Other German ships were the old sailing ship of the line SMS Renown and the frigates SMS Gefion, Niobe and Thetis. These ships were used as training ships and hopelessly out dated in fights with modern armoured ships. So most of the time they either had the watch over their harbours or were used as bases and not taken into combat missions. So except these 5 last mentioned ships the German navy had 37 ships to fight an enemy multiple times as big. France had the second biggest fleet in that times. That was the situation of the Fleet of the North German Federation in 1870. In July 1870 the German Naval commander was Admiral Adalbert Prinz von Preu&#223;en. However he wasn&#8217;t really able to lead the fleet on the seas any more because he had bad eyes, so the real commander was Vice admiral Eduard (v.) Jachmann. 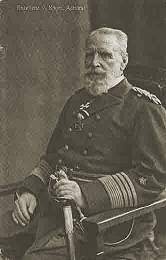 Jachmann expected because of the health of Prinz Adalbert he would lead the Armoured Squadron in June 1870 into the Atlantic ocean to make exercises there. But for the last time the price was given the command. It was clear he wasn&#8217;t able to do so, but he should get the command for a last time. But this voyage started under bad signs: The SMS Friedrich Carl and SMS Kronprinz were damaged and had to go to Britain into dock there as there was no suitable dock in Germany. Also SMS K&#246;nig Wilhelm had troubles with the engines and so the only ship in the squadron to come to Britain without problems was SMS Prinz Adalbert, a ship which had commonly problems. These problems were not entirely solved at July 1st, when the squadron, together with SMS Renown and SMS Delphin was formed in Plymouth. The Prince wanted to go into the Atlantic ocean a few days later, where SMS Arcona should join the task force. But shortly before the North German ambassador, Graf von Bernstorff, made a warning because of tensions with France. Oberst Roerdanz, military attach&#233; in London, who should make excellent intelligence work in the war later, had warned Bernstorff before. So the prince decided to detach SMS Prinz Adalbert to take the latest news from the embassy. He drove to the west entrance of the Channel but soon decided to go back to rejoin with the ironclad. On July 13th the squadron was again complete as the ironclad returned with Bismarck&#8217;s war warning for all German ships. Also the commander of SMS Preu&#223;ischer Adler brought a telegram with Bismarck&#8217;s order to return immediately. The Prince decided at once to return to Germany. As the ships had nothing more than exercise ammunitions the voyage had to be made at full speed. Because this was too much for SMS Prnz Adalbert, the ship had to be pulled by SMS Kronprinz. But the German ships reached Wilhelmshaven on July 16th. But this was still a secret for the French who still thought the German squadron was in the channel and sent a fleet on July 24th to search and destroy the German ships. 1. To protect the German shores from enemy bombardment/ landings. The French Rear Admiral Bou&#235;t-Willaumez made already in 1867 this plan: The North Fleet should drive into the North Sea and then to the Baltic after the Mediterranean Fleet arrived. Then a transport fleet of about 100 ships should bring 30.000 men to Denmark to &#8220;convince&#8221; the Danes to go for war. Indeed the Germans had only one corps to guard the Danes and Austrians each. But this plan didn&#8217;t work: Due to the fast German victories the units supposed to land in Denmark were now used in France. 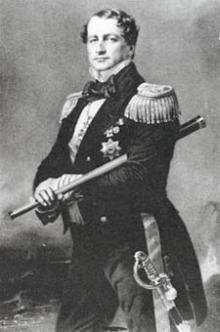 So the Danes could not be &#8220;convinced&#8221; by the squadron Vice Admiral Bou&#235;t-Willaumez lead to declare war. Nevertheless it is remarkable that the German armoured ships were not in Kiel threatening Copenhagen, in a fortified harbour instead of Wilhelmshaven, where the entire port was still being built and where no real fortifications were in that days. Since the German North Sea coast is not very suitable for amphibious landings the reason must have been the security of Hamburg and Bremen. But you can question here if it wouldn&#8217;t have been better to have the ships in Kiel as a new front in the North Germany couldn&#8217;t afford. Also you can criticise Jachmann for not being very offensively in the later phase. But not only the German navy was not prepared, also the French had difficulties. Instead of 14 armoured ships the French North Squadron under Vice Admiral Bou&#235;t-Willaumez left with only 7 armoured ships Cherbourg to search the Germans, who were already at Wilhelmshaven. These seven ships were Surveillante, Gauloise, Guyenne, Flandre, Oc&#233;an, armoured corvettes Thetis, Jeanne d&#8217;Arc and aviso Cassard. These ships had also problems like the German ships. Additionally they seem to have over estimated the fighting power of SMS K&#246;nig Wilhelm. They acted very cautious by driving through Channel and North Sea. So they were never insight of the German coast. 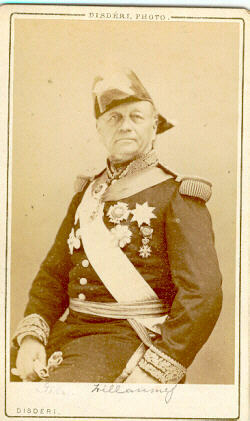 Instead of making a blockade and wait for the Mediterranean squadron, Bou&#235;t-Willaumez decided to go to Denmark. On July 28th they passed Skagen. Two days later Thetis brought bad news. Denmark refused to declare war on Germany. 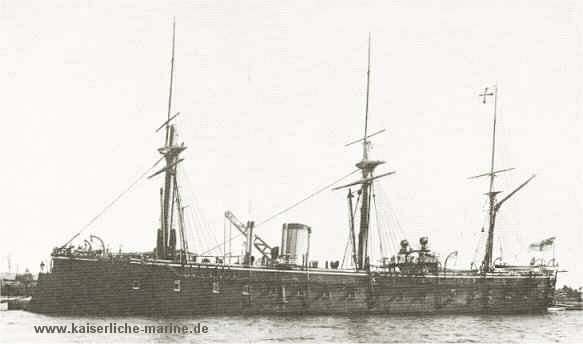 In the mean time the French were unable to catch the SMS Arminius, which was on her way to Wilhelmshaven, where she finally arrived without problems. A few days later, Jachmann was reported two enemy armoured ships were on the way to Denmark. This was wrong. So the sortie of the German squadron on August 5th up to the Limfjord in Northern J&#252;tland was in vain. Two days later the squadron reached Wilhelmshaven. On August 11th the situation changed dramatically. Near Helgoland the armed merchant freighter Helgoland spotted a second French fleet, the &#8220;Escadre de la M&#233;diterran&#233;e&#8221;, now &#8220;Escadre de la mer du norde&#8221;, lead by Vice Admiral Fourichon. He had the following ships: Armoured frigates Magnanime, Provence, H&#233;roine, Couronne, Invincible, Valeureuse, Revenche, the armoured corvette Atalante, the wooden corvettes Chateau R&#233;naud, Cosmao and the avisos Renard and D&#233;cr&#232;s. One division was sent to the Jade and Weser, the other to the Elbe. On the very next day he declared the blockade of the German coast. He could use the then British Helgoland as a base for supply with coal and food. The British colonel Marxen, commander of Helgoland, thereby did not leave the border of the neutrality laws, but was nevertheless sometime near to it. The blockade was not very successful for the French as in the official reports, the &#8220;Moniteur universelles&#8221; not a single capture of a German ship was made public. However Jachmann ordered for the 12th an attack on the enemy ships. But the three battleship commanders, Kapit&#228;ne zur See Henk (SMS K&#246;nig Wilhelm), Klatt (SMS Friedrich Carl) and Werner (SMS Kronprinz) intervened. They did not fear the enemy, but feared that severe damages could mean the end of the ability to be in service as there were no real docks in Germany to repair the ships. And the presence of the ships alone was the best answer to cope with enemy attacks on the German harbours. Some historians even said they were cowards, but since SMS K&#246;nig Wilhelm and SMS Friedrich Carl were not operational and Kapit&#228;n Werner, who harassed the enemy fleet many times, wanted to get the permission even to attack Cherbourg (! ), this is wrong to say so. So the strike was abandoned. Nevertheless SMS Kronprinz, Arminius and armed auxiliary cruiser harassed the enemy ships ever and ever again. These harassments, the fact of the difficult waters to navigate and the fear of the SMS K&#246;nig Wilhelm lead Fourichon not to obey his order of August 28th to attack Wilhelmshaven at any costs. 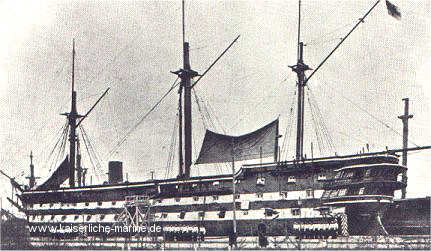 Instead bad weather in September lead to some damages on the French ships, so that on 10th of September Fourichon went back to Cherbourg for repairs. On the way he met the aviso Hirondelle which brought the news he was the new Republican Minister of the navy. So he went to Paris once he reached Cherbourg. A day after the French retreated, Jachmann made another sortie to attack the French ships he supposed to be scattered due to a storm. He found nothing. On September 25th the French Baltic sea squadron arrived at Helgoland on the way back home. The Republican government wanted to use the crews in the land fights. Jachmann now did not attack. Therefore he was critized, as the odds were now better. Bou&#235;t-Willaumez and Rear Admiral de Geuydon got the order to form squadrons with the rest of the crews. Indeed Fourichon ordered 30.000 navy soldiers to fight on the land. Even one Admiral, Rear Admiral Kellermans, was cought at Stra&#223;burg. So now the situation changed dramatically, as now the French had to worry about German strikes. So they did their best to avoid that by making several sorties with their ships into the German Bay. That&#8217;s why the German crews had to be still in full alert. Which was not very comfortable when it became frosty. In December finally the docks were ready to repair and overhaul the battleships. It was a difficulty to get the big ships into the dock and even more to repair them as the German personnel had not much knowledge of doing so. Also the danger of a French attack was still imminent. Nevertheless the ships returned into service in January. Now finally SMS Kronprinz was allowed to attack Cherbourg while SMS Elisabeth got the order to fight a cruiser war on the French coast. These orders were spoilage when the news of the cease fire arrived. However before that SMS Augusta under Korvettenkapit&#228;n Johannes Weickhmann left Kiel on December 12th. The order was to take any enemy merchant ship. The German government did give up all scrupolosities when the French Republican government got arms by US and British sources, so the German self effacement was given up. So SMS Augusta was sent to interrupt this trade at the French Atlantic coast. On January 4th two French barques, St. Marc and Pierre Adolphe with grain for the army, were captured at the mouth of the Gironde and taken as prize. Both were sent to Germany, but Pierre Adolphe sunk in a storm off the Norwegian coast. The crew was rescued. St. Marc arrived Kiel where the ship was given back to the owner, since war was over. On January 4th SMS Augusta also met and sunk the French steamer Mars full with arms. Then she looked for other enemy ships but did not find any and so went to Vigo in Spain. There H&#233;roine appeared. Three other French warships entered a few days later the harbour, so that also SMS Augusta was caught until the cease fire of February 7th. She left Vigo and entered Kiel two weeks later. Weickhmann was one of the few sailors to get the Iron Cross 2nd class. War was over. To my knowledge Mars is the only ship to be sunk in this war. The German ships in the Baltic were nearly only gunboats. Only the avisos SMS Preu&#223;ischer Adler (Flag ship Konteradmiral (Rear admiral) Eduard Heldt) and SMS Grille and the corvette SMS Nymphe were exceptions. 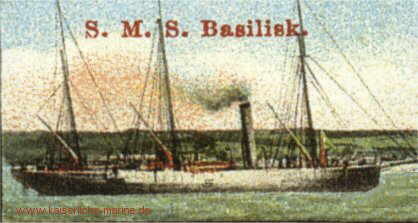 SMS Grille operated in the waters of R&#252;gen, while SMS Nymphe was in Danzig. So Heldt was also only able to harass the enemy, even less than Jachmann. But also Bou&#235;t-Willaumez had his problems. His orders were not clear, as sometimes it was demanded to be cautious, then offensive. Also he had nearly no ships for the shallow Baltic waters, and the landing force was also not there. So he had the same result like Fourichon: Nothing captured. The bombardment of Kolberg and Danzig was not made due to the fact the Germans could take revenge on captured French cities (which was the real reason and in no way the &#8220;humanitarian&#8221; reasons the French press published). So more than cruising in the Baltic was not possible for the French navy. Only two fights should be mentioned here, the fights of SMS Grille and SMS Nymphe. On a sortie to scout the French base in the Danish Kj&#246;ge bay on August 17th SMS Grille as leading ship for three gunboats under the command of Korvettenkapit&#228;n Graf von Waldersee met three French frigates and an aviso. Although the small German flotilla was outnumbered the French retreated because of the shallow waters. Therefore all operations against Swinem&#252;nde had to be abandoned. Graf von Waldersee got for this brave fight the Iron Cross 2nd class, one of the few orders given to German navy personnel. The other fight took place already on July 23rd. On July 22nd 3 armoured ships arrived at Danzig and anchored in the Putziger Wiek at about 6 o&#8217;clock PM. On midnight SMS Nymphe, commander Fregattenkapit&#228;n Weickhmannn, made a surprising sortie on the enemy. In a distance of about 1.1 sm SMS Nymphe fired two broadsides on the Thetis and then retreated to Neufahrwasser immediately without being hit. That event showed Bou&#235;t-Willaumez that heavy ships were not very suitable for the fights in the Baltic. But since SMS Nymphe had not enough speed for cruiser warfare in the Baltic, she was put out of service and the crew transferred to SMS Augusta which was now repaired and refitted to do the job. Soon after Fourichon left the North Sea, Bou&#235;t-Willaumez got the order to come home. That meant the end of the war in the Baltic. German navy soldiers fought also in the land war. The Navy adjutant of War minister Roon, Korvettenkapit&#228;n Freiherr von Reibnitz lead a detachment against river gunboats on the Rhine by the siege of Stra&#223;burg. A similar task had the Torpedo (mine) detachment at the mouth of the river Seine. On the Loire German navy soldiers under Leutnant zur See Jeschke captured 6 French river gunboats. Here the situation for the 4 German ships was not good. Far away from home and an enemy with many ships and stations they had to do the very best they could. In East Asia were SMS Hertha and SMS Medusa. They had there different tasks from hunting pirates to diplomatic and intelligence tasks. In July both ships were in repair in the brand new yards of Yokosuka in Japan. SMS Hertha got the order to go to Tientsin. There a month before all French citizens were murdered and French reprisals were possible, endangering also the subjects of other states, including Germans. 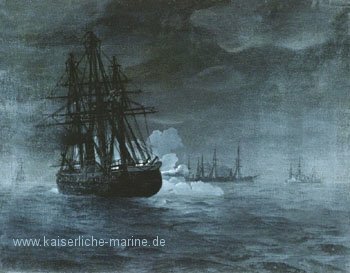 On August 8th Kapit&#228;n zur See Heinrich K&#246;hler got the news of the outbreak of a war with France and so left Tientsin as soon as possible as he remarked the French ships were preparing for fight. He went to Japan in the hope the French had now to split their forces to fight the Germans and Chinese, which would be good for German ships to arrive neutral ports. He wanted to join with SMS Medusa. SMS Hertha arrived at Nagasaki on the 19th only to find a French frigate there! So the best was he could do was to negotiate a cease fire in the Sino- Japanese waters. The French had free hand against China and the German ships there were safe when the diplomats finally agreed to that. K&#246;hler got at Nagasaki new orders. He should join SMS Medusa and then make a cruiser war. He should avoid fights with enemy ships in superior number. So he went to Yokohama but SMS Medusa was still not ready. End of September a French squadron with an armoured frigate appeared at Yokohama. The German ambassador in Japan was given a note by his French colleague that the French government decided to post pone the differences with China in favour of fighting the Germans. A French aviso had just tried to catch the German steamer Rhein, but the ship escaped. But due to the cease fire about 200 German ships arrived neutral ports. Only 2 were captured near Singapore. SMS Hertha and SMS Medusa were caught in Yokohama by about 26 French ships. An attempt to form a convoy to Hong Kong was answered by the threat of the French admiral to blockade Yokohama! That would have been equal to an aggressive act against Japan! The French Republican command wanted the &#8220;total war&#8221;. So it is no wonder that the French admiral refused to end the blockade when he got the news of a cease fire until the 19th of February on that date. He said war was now going on. So this blockade lasted another month until the peace of Frankfurt am Main was in force. SMS Arcona was in Horta on the Azores, when the news of war came. She had problems with the engines and also 50 dead soldiers due to yellow fever, the only epidemic on a German warship. Additionally 10 soldiers deserted, so the ship had problems. Although 27 soldiers as replenishment arrived before the outbreak of the war, Korvettenkapit&#228;n Freiherr von Reibnitz decided not to go to Germany via Scotland. He stayed in the area and had a small fight with the superior French Montcalm, an armoured frigate. A fight with the French frigate Bellone, which was agreed by the consuls of both nations, did not take place because of a storm. On January 1st SMS Arcona went to Lissabon and arrived there two weeks later. There she was repaired, since she was damaged in a storm on this voyage. The German command ordered to stay in Lissabon so the war was over for this ship. But now to the last ship: SMS Meteor. This ship fought the toughest naval fight in this war. The gunboat was in Venezuela to &#8220;convince&#8221; the Venezuelan government to pay some debts. There Kapit&#228;nleutnant (v.) Knorr (later Admiral) got the news of tensions between Germany and France by the German ambassador in Washington. He was in a difficult situation as he had no intelligence news about the situation and only a light warship. So he decided to go to Key West, under sails to save coals. Knorr was unable to convince the ambassador to equip a fast merchant as auxiliary cruiser as this was not seen very positive by Bismarck. An attack on French ships was not wished by Berlin. On October 23rd finally the news of the outbreak of war reached the SMS Meteor. The Us also ordered to leave the port. In the next days she cruised in the area of the Bahamas in shallow water, relative safe of heavy French warships. Due to the need of coals she arrived Havanna on November 7th, shortly before the French aviso Bouvet under the command by Fregattenkapit&#228;n Franquet (later Vice admiral) had arrived. So she left the port and waited for the aviso. But she didn&#8217;t come. So she returned to port where Knorr was informed by the Spanish that due to neutrality law a ship of another belligerent country had to wait 24 hours after the enemy left the port. So both consuls agreed for a fight on the 9th. The next day at about 13.15 Bouvet left the port, 24 hours later SMS Meteor. What now followed is the last gentlemen&#8217;s fight of warships (as the consuls have negotiated the fight). At about 13.30 the fight began. On 0.8 sm Bouvet opened fire, while SMS Meteor fired in a distance of 0.5 sm. Because of the swell no side achieved a hit. So Bouvet tried to ram the gunboat. In the last moment Knorr recognized it. He just turned but the side of the SMS Meteor was damaged and the rigs destroyed. For a moment also the guns were out of order so only one hit was achieved. It didn&#8217;t look good for the German ship. Within this attempt, the French soldiers fired with fire arms on the Germans. 2 Germans died and another was injured. But due to the fact the rigs were now entirely over board speed and manoeuvrability were regained as well as the guns repaired. 300 m away the Bouvet turned showed her side. Now the aviso was hit by the 15 cm gun of the SMS Meteor. The shell destroyed the engines so that only the rigs could be used. Bouvet tried to escape to Havanna. The SMS Meteor tried to catch her but parts of the rig stopped the ship&#8217;s propeller. So the ship was disabled. And when she was ready again the Bouvet arrived Havanna. The fact that Bouvet retreated makes this fight to a German victory by points. 10 French sailors were wounded in this fight, 3 severely. Knorr was promoted to Korvettenkapit&#228;n, Franquet to Captain. Knorr and 4 German soldiers got the Iron Cross 2nd class. The wounded German had to be brought into hospital, the two dead Germans were buried in Havanna. SMS Meteor had to be repaired but due to French interventions this was not finished before April 1871. This fight remains in one part a mystery. The armament of Bouvet. Nearly all the sources have different informations. But the fact she opened fire before SMS Meteor seems that she was artilleristical superior to the gunboat. But why she tried to ram the ship? These questions are not solvable totally any more. 1. To save the German shores. Due to the fleet in being position of the German armoured frigates the French ships in the North sea were not able or willing to control the German shores. In the Baltic the few German ships had to rely on the shore batteries to prevent a landing. Nevertheless harassments on both seas were quite successful as the French had to fight a kind of guerrilla warfare on the sea. The French had more heavy units but in the shallow German waters smaller ships were much more needed. 2. Denmark was not willing to declare war. There were many reasons for that but one of them was the fact Germany had three armoured frigates, while the Danes had none. 3. To damage the enemy fleet. This point did not work very much indeed. However the situation for that was only partially given. At first only harassments were possible and later the political situation had changed. So the sinking of one French steamer and the capture of two barques is the only success here, if you leave out the damages Bouvet had. In all the German fleet did their best. There can be critic in some points, like Jachmann&#8217;s a bit too careful behaviour in some occasions. But although in shadow of the land war, it is unfair not to see the work these few ships did. This was not recognized by the German people as there was only a small navy detachment at the victory parade as well as the difficulties for the naval personnel to get the war coin. They fulfilled their task. The French navy instead was unable to attack German shores and to bring Denmark into war with Germany. Also the blockade was not that successful as nearly no ship was seized or sunk. Later they had even to cope with the danger of a German attack. Also they were unable to sink any German warship. Given that the German fleet won by points against a supremacy. After the war there were demands in Germany but also in Russia and Britain to take over at least parts of the French navy. Bismarck, who was in no way such a big naval enthusiast as Prinz Adalbert, said to him, Germany had not enough men for the crews of these ships. Indeed some German ships had to be laid up due to the lack of man power in the war. So the fleet was built up steadily to become the second biggest fleet in 1914. But that is another story. I did not find any picture of Admiral Fourichon. I would post it here, so send it to me, if you have. Torpedo: In that days also designation for mines. I tried to use it in the modern form but I could be wrong with the 7 auxiliar torpedo boats. I am in no way sure, if a torpedo was launched in this war. I don&#180;t think so. @kalif: Du brauchst es ja nicht zu lesen! (You do not need to read it). Also additional information. SMS Renown was just bought by Britain for the German navy as artillery training ship in 1870. In the war she was used as floating battery to protect Kiel. Lissa showed that ships of the line were out dated. There the Austrian SMS Kaiser was badly damaged by Italian armoured frigates. 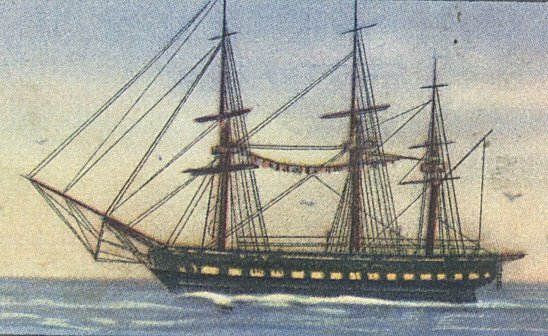 In 19th century German navy the ships bought from the Royal navy kept mostly the names, so HMS Renown became only SMS Renown. You don't have to say that this essay will be from the German side, we know that when you write it's always from the German side. Fortunately I don't think I ever got to read you thread about Slesvig-Holsten, but I remember you twisting facts about that conflict before in other threads. But despite the fact that the Prussian and Austrian navies were too small to beat the Danes, the Germans were able not only to beat the Danes in Jutland but also to invade Alsen. Well of course they were, you don't need Navies in land battles! Jylland is connected to Germany via land, and Als is so close to Jylland that you go there by rowboat, not by ships. Navy strenght is irrellevant in both cases, so there is no "despite" here. And how come you only mention the battle of Eckernförde, when you talk about fighting involving ships in the first Slesvig-Holsten war? Oh never mind, I know why. It's because it was the only battle involving ships that was actually won by the Germans. I see it in your posts about German history again and again. You twist facts, ignore facts and subjectively singles out the incidents glorifying Germany. It's it deliberate, or is it just your nationalism that blinds you Adler? Experience and human interaction has made me an arrogant bigot. 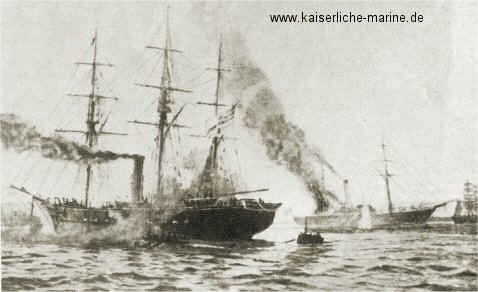 Due to the uproar in Greece in 1863 a Prussian squadron formed from SMS Preu&#223;ischer Adler, Basilisk and Blitz left Prussia to protect German civilians, Commander was Korvettenkapit&#228;n von Klatt. In December 1864 the squadron got the news of problems with Denmark so they came home. 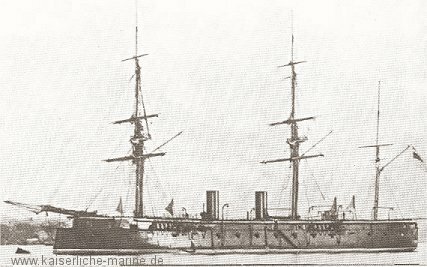 The voyage had to be interrupted some times due to damages on SMS Preu&#223;ischer Adler, so the arrived Nieuwediep not before 14.04.1864, where they got the news about the begin of the 2nd Danish German war. The commander decided not to drive to Germany directly, but to wait on Austrian ships. With SMS Radetzky and Schwarzenberg two Austrian frigates under the command of Linienschiffskapit&#228;n (= Captain) v. Tegethoff the Austrian help came. The use of Austrian ships in the North Sea had diplomatic trouble with Britain as consequence. However the German ships, as Austria was still in the German Federation, left the port. At Helgoland the squadron was caught by a Danish squadron consisting of the Danish Niels Juel, Jylland (frigates) and the corvette Heimdal. As the Prussian ships were low on coal and were very small compared to the Danes Tegetthoff gave the order to save the ships if needed at the very beginning. Despite this and the need of firing fat instead of coals, the Prussian ships stayed in the line. Both Austrian frigates were damaged in this struggle. 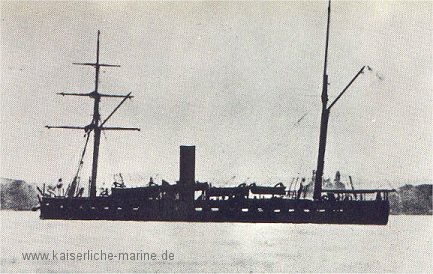 SMS Schwarzenberg had to be rescued by the Prussian ships together with SMS Radetzky. In this fight the Prussian ships were not hit. However Leutnant zur See von Werner, gun commander on SMS Basilisk, claimed after the battle to have hit Jylland. As there was no record in the Danish sources, he later said he must have seen wrong. At the end of the day both frigates were damaged badly. So the battle itself is a Danish victory indeed. However it lead to the end of the Danish blockade and so had the consequences of a Prussian and Austrian victory. Later in that war more Austrian ships came to take prizes and to help the German armies. So the next point you said Storealax is I would only give a nationalistic German point of view. That is what I strongly disagree with. I do have my own opinion about the consequences on several historical disputes. And I am a German, who went to school in Germany. So I have a certain background as well as you are a Dane who most probably went to school in Denmark. So as the history school books have different points of view, as well as historical books in general, on some things there are disputes. Then we can discuss there. Hans H. Hildebrand/ Albert R&#246;hr/ Hans- Otto Steinmetz: Die deutschen Kriegsschiffe. Also I had no French source or any detail about the French side, so I had to give the hint. All mentioned ships here on this page had engines in addition to their sails. The exceptions are the German sailing frigates and the Danish Christian VIII. Also SMS Renown had engines. Just a small comment, Adler: I know, in German it's Deutsch-Franz&#246;sischer Krieg and that is correct and all, but the war is commonly referred to as the Franco-Prussian War in English. Fight wars, die in a blaze of glory; come home, meat in a plastic sack! After your description of the battle, you wrote something like "And now after the German victory, the people of Slesvig-Holsten were free again" Here you completely ignored that the majority Slesvig was Danish, and even 68 years later, more than 50% of Slesvig voted to come home to Denmark, rather than to stay with Germany. The truth is that both sides had several old documents and treaties that gave them the "right" to the territories, and both sides wanted to incorporate areas with foreign minorities in their countries. Denmark wanted all of Slesvig, even though the Southern part was German, and Germany wanted it all too, even though Northern Slesvig was Danish. No one really cared about the minorities, because they sided with the "enemy". But you completely ignore that, which annoys me a lot. Personally, I think people should have voted, and then the border should have been drawn acordingly. Then Most of Slesvig would be Danish, and the Germans would live in Germany, and everyone would be happy, except the powerhungry politicians and Kings. Oh and it's not only in this period of time your nationalism, or at least your bias is shown. It dosn't matter if it's WWII or Colonial wars in Africa, you can always count on Adler speaking only positively of Germany, ignoring it's faults. At first I have to say, that the figures of the Danish losses in the invasion on Alsen are different from source to source. So I won&#180;t say anything hereon as there are no exact numbers. However it seems approx. 4800 Danish soldiers were lost, among them 3000 POW. Also in the election you have to be more precisely. At first there were two areas of voting. The first was the part of Schleswig now belonging to Denmark. In Germany it is called Nordschleswig, in Denmark Sydjylland (sp?) or also Nordslesvig. In this area indeed 74.9 % wanted to go to Denmark. However because of the fact the votes were counted en bloc and not for each community, German majorities, especially Tondern and Hoyer, had to become Danish. Although there sometimes over 75 % voted for Germany. In Southern Schleswig 80.2 % voted to stay in Germany. Only on F&#246;hr three small villages voted for Denmark. The so called compromise proposal, Tiedje line, was not accepted. So it is historical wrong to say the Danes were in majority. Indeed the Danes were in whole Schleswig in minority, only in the north they were in majority. The next point is that both sides wanted Schleswig totally. And I would ignore the situation of the minorities. For the last point it is true, that I did not mention the situation of the minorities. However Bismarck would have accepted a peace treaty with the Danes keeping Northern Schleswig in the so called Tiedje line approx. However due to the fact the Danes refused to make peace before Alsen and to the incapability of their diplomats in the following peace talks, Denmark lost also the Danish part of Nordschleswig. Even after Alsen Bismarck would have agreed to that compromise. However we reached a situation we have to talk about the reasons for these wars of 1848 and 1864. Reasons of which Lord Palmerston, British Prime minister, once said only 3 people had ever known the reasons. One of them, Prince Albert, was dead, another, an official, mad and he himself had forgotten the answer. Indeed for foreigners it is very difficulty to understand it. In medievel times Schleswig and Holstein had long troubles with Denmark. Holstein was part of the Holy Roman empire, Schleswig not. Due to dynastical reasons both duchies were de facto united under a duke. But soon this dynasty died out and the heir coincidentally just have become King of Denmark. So the treaty of Ripen was made. In this treaty the Danish king was accepted as Duke as long as he accepted the unity and liberty of both duchies. In 1848 and 1863 however the Danes tried to annex Schleswig breaking the treaty. In both times the German parliament resp. the German Federation had to come to help a member state to protect its rights. Further infos you get on my thread about the history of Schleswig- Holstein. To the last point of saying I am biased. Indeed I never said something about denying the Holocaust or other faults of my people. It is indeed the darkest hour of my people and of civilization itself. But did I glorify the killings of innocent? No. But that was also never to discuss here. Or the posts of such an Ahmadinedschad/ Hitler fan I did not see. Also I never said it was not bad to kill the Hereros. Indeed that was also the darkest phase in German colonialism. The only thing here I said, that pushing the Hereros into the Nama desert was in no way planned by the incompetent von Trotha, who was indeed reordered due to the interventions of the Reichstag, which also lead to stop all activities against the Hereros. Trotha wanted to deny his incapabilities by saying it was planned. Indeed he wanted to capture them like in Sedan. But therefore he was too incompetent, so he said it was his idea to push them into the desert. However comparing the Germans with the other colonial powers they were not worse than the others. Indeed it is considered the Belgians were the worst. And if you see the rule of Schnee in German East Africa or in Togo, where the German govenor Adolf Friedrich Herzog zu Mecklenburg- Schwerin was asked for help by building an independent state, it was in no way in all phases or areas a bad ruling. However there were bad times, what I never denied. I see the errors and bad times. I never argued against that in general. However I also gave further informations if needed. But that never lead to a situation I denied the errors. My articles here were &#225;ll based upon German history indeed. However I tried to give always parts of the history of my country which are not known very much. I only wanted to give further details. However I can here announce my next article won&#180;t be about German history. But that comes not before 2 weeks from now. Also I think if we want to discuss about Schleswig- Holstein we should do that in that thread as this is about the Naval warfare in the Franco German war of 1870/71 and not of the Wars with Denmark. A last remark on something I overread last time. I agree with you Storealax, that it was a tragedy that there was no compromise to be found. However I also think it was pretty much impossible, especially due to the Danish nationalists. Nevertheless Bismarck would have accepted a partition of Schleswig like he ordered his ambassador at the peace talks.